In the Christian world you often hear people say that God takes things away because He wants to give you something better, but what happens when the something better doesn’t come? What happens in the in between moments. The waiting for the better to finally arrive. Most times our mindset is against God. We look at whatever it is we lost; a job, a possession, someone you loved, and we believe that God took it from us because He is against us. That He’s crushing our hearts. That mentality is wrong in so many ways. Instead of believing that God is against us, we should take on the mindset that He is with us. In Psalm 23 is says that God is our guide through right paths. Have you ever had to play those ice breaker games where you and another person have to get through a course but one of you is blindfolded? Those games are the worse! You have to truly listen. Usually the “guide” is far and the blind partner has to follow their voice. It would be so much easier if the guide was right next to the blind person. The Bible states that we are going through an obstacle course called life, but as God’s children we have been given a guide who isn’t on the other side of our circumstances but is walking through them with us!!!! He walks with us through the valleys. He never leaves us to journey through it alone. Because He is with us we don’t have to fear the darkest days. I was recently at a service where they were talking about the rod and the staff. I have heard this verse repeated and talked about numerous times but I had never realized how contradicting the verse, “Your rod and staff, they comfort me” was. If you ponder on this thought for a moment you realize that a rod and staff aren’t exactly soft sweats, homemade mac n cheese, warm vanilla comfort. A rod was something used to count and protect sheep from predators. A staff was used for the shepherd to not only lean on but also to help guide them back if they veered off. Psalm 23 paints a picture of a God that not only disciplines us but protects and guides us to where we need to be. We can no longer believe in good times or hard times that God is against us. We must fight the temptation to accuse Him of leaving us. Leaving is the last thing He would ever want to do, and He can’t because He is connected to us. I got messed up by two simple truths this week: 1. We are connected to Jesus and 2. God prunes us to make us grow more. The fact that we are connected to Jesus is a HUGE thing especially when we are in a wilderness season. Think about it, if you were a vine and one of your branches was cut off, would you feel it? I believe you totally would. Think about when you get the smallest paper cut on one of your fingers, it can be the worse pain. I have been blown away by the fact that I am connected to Jesus, and He took the pain that I feel. He took that pain in the fullness and died for it. In the moments where consequences are facing you because of choices you made or when the darkness of life feels like it’s consuming you, lift up your head dear friend, Jesus knows how you feel. He is with you and most importantly He is connected to you. Because of the cross He has experienced the ultimate pain for our sin and circumstances. Thank God! Sometimes the pain of life is so bad, I cannot imagine another ounce of pain being added. I am so thankful for a Savior that took all of it and chooses to still walk through life with me! That is only half of John 15. The second half is that sometimes God doesn’t cut things out of our lives because we were doing a bad job, but He prunes us so that we can GROW more!!!! We cannot believe that God just wants to take everything away so He can be entertained. He prunes us back, knowing that it may hurt, but it’s to make us more. When we are cut back from our resources we have to rely on the source of life, when we rely on the source we are able to grow and be more fruitful. What an amazing God we have! I pray that God shifts your mindset on Him everyday. There is so much that we learn as we grow up, but life with God is found in the undoing of the knowledge we’ve learned and embracing the beautiful relationship that Jesus came to die for. He wanted you that bad. If you’re going through a rough season I want to challenge you to do a few things, read Psalm 23 and John 15. Be honest with God (If you need help I included a prayer at the bottom). Your honesty doesn’t scare Him. And lastly check out this song that has helped me through the last two weeks of life. I hope it ministers to you. Yes seasons like this hurt but know that He’s crushing things out of you that hinder you and He’s comforting you all the way. Take comfort it that truth. I don’t understand a lot of things but in this season I don’t understand why you would allow so much to happen at once. I don’t understand why you would allow my world to fall apart. I don’t understand why you would strip away all that I hold dear in a matter of a moment. 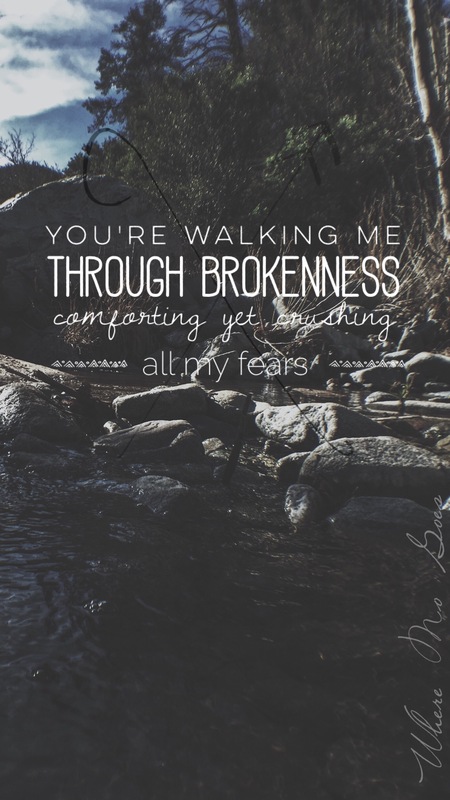 I don’t understand why such extreme brokenness had to hit your servant, but I will not walk away. I refuse to believe that you are anything less than faithful. I choose to believe that tomorrow will always prove that today was worth it. That this season is necessary. That You never left or abandoned me. Instead of focusing on my circumstances I choose to say, “For who is God, but the Lord? And who is a rock, except our God?— the God who equipped me with strength and made my way blameless. He made my feet like the feet of a deer and set me secure on the heights. He trains my hands for war, so that my arms can bend a bow of bronze. You have given me the shield of your salvation, and your right hand supported me, and your gentleness made me great. You gave a wide place for my steps under me, and my feet did not slip.”‭‭Psalm‬ ‭18:31-36‬ ‭ESV‬‬ You have walked me through valleys before and I know that you are walking me through one now.